Varnishing your paintings protects and provides the surface of your painting with a consistent surface. It can also add a glossy finish and make the colors more intense. 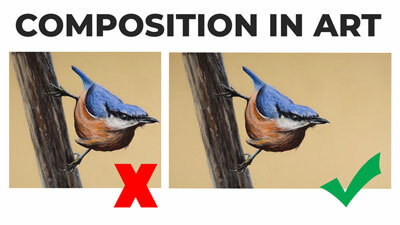 Unfortunately, many amateur artists skip this essential step and some don’t even feel that it’s necessary. So, do you really need to varnish your paintings and protect them? Well, do you have antivirus software to protect your computer? Do your children have winter coats to protect them from the cold? Our paintings need a coat too. Not a winter coat, but a coat of varnish. Varnishing your art will go a long way in preserving it for years to come and may even make them look better too. What are we protecting our paintings from anyway? Well air, for one thing. Air contains a variety of pollutants that cling to the surface of a painting. Over time these pollutants will alter the colors. Besides the air, we protect our paintings from moistures, liquids, dust, and other contaminants as well. 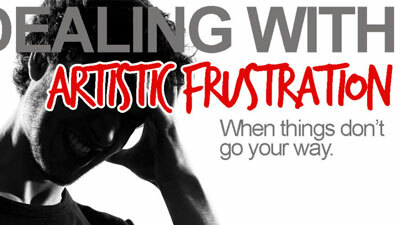 Spills, sneezes, and even humidity can contribute to the deterioration of a painting. 1. Mixing paint brands. Different brands of paint use different ratios of ingredients (binder/pigment). Some brands use “filler” materials as well. This inconsistency results in a ranging level of sheen. 2. Medium. 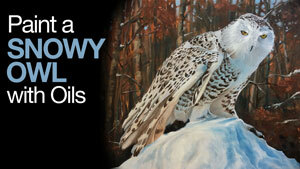 Oil painters often use medium to control the viscosity of their paint. Some medium(s) are glossy. Unless your paint has the same amount of medium in each stroke you are likely to end up with an uneven surface. 3. Glazing. Glazing is a wonderful technique used to create subtle, gradual changes in color. A glazed layer of paint will dry glossy. If you glaze only parts of your painting you will definitely need to use a coat of varnish to even out the surface sheen. Thankfully, when varnish is applied, it eradicates these inconsistencies and we are left with a painting that not only is protected, but also looks great. The type of varnish that you choose depends on the type of finish that you desire. Some varnishes dry to glossy finish and make the colors more intense, while others dry to an even matt finish and mute the colors. Without a doubt, the number one varnish used on oil paintings is Damar Varnish. It is made from only damar resin, turpentine, and alcohol. Damar varnish dries to a high gloss finish and can be applied with a brush or as a spray. As the name implies, this form of varnish dries to a high gloss finish. This varnish can be applied with a brush, but it is also available as a spray which some folks may prefer. Matt varnish dries to a flat finish without any gloss or shine. You won’t get any reflection with this varnish, but the colors will look duller. This varnish can be brushed on or applied as a spray. Satin varnish dries to a semi-gloss finish. If you’re looking for a slightly glossy finish, but high gloss is a little too strong, you may consider this varnish. 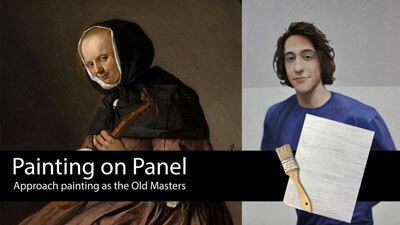 Retouch varnish is used during the painting process to even out the sheen of a painting. 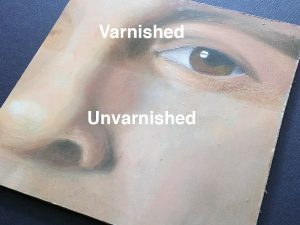 Retouch varnish is also used to refresh dull areas of an older painting that has already been varnished. There are other factors to consider besides just the finish. You also need to consider the painting medium. 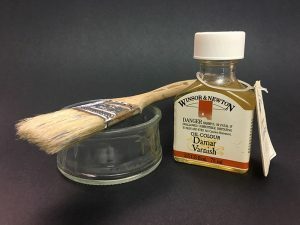 While traditional varnishes like Damar varnish, are recommended for oil paintings, it is suggested to use a specially formulated varnish for acrylics or water-mixable oils. Manufacturers have developed special varnishes for acrylics that can be removed. These varnishes are brushed on. 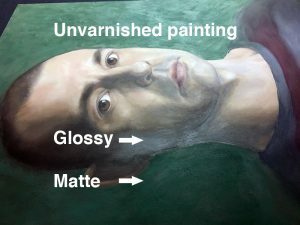 Spray varnishes can be used for these types of paintings but it may be hard to remove the varnish if you need to in the future. For water mixable oils, Winsor and Netwon recommend their Artisan varnishes which are available in a range of finishes including gloss, matt, and satin. Varnish can be applied with a brush or it can be applied in aerosol form. Both forms of application methods have their benefits and drawbacks. Applying as a spray can help ensure an even application, but it does encourage contaminants (dust, dirt, small bugs) which could dry into the surface of the varnish. Brushed applications provide more control and a thicker application, but some may find it difficult to apply an even amount of varnish. For heavily textured paintings that make use of Impasto painting techniques, a sprayed application is recommended. 1. Wipe the surface of your painting with a clean, dry cloth and choose a dust free environment to apply varnish. 2. 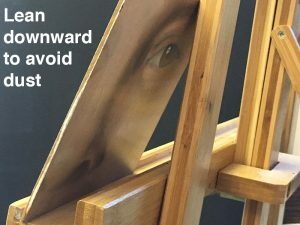 Lay your painting on a flat surface. Varnish is thinner than paint and applying it vertically may lead to drips/runs. 3. Stir or shake the bottle of varnish then pour an appropriate amount into a wide dish that your brush will easily fit into. 3. Apply the varnish with a wide soft brush in even rows using long strokes from top to bottom. 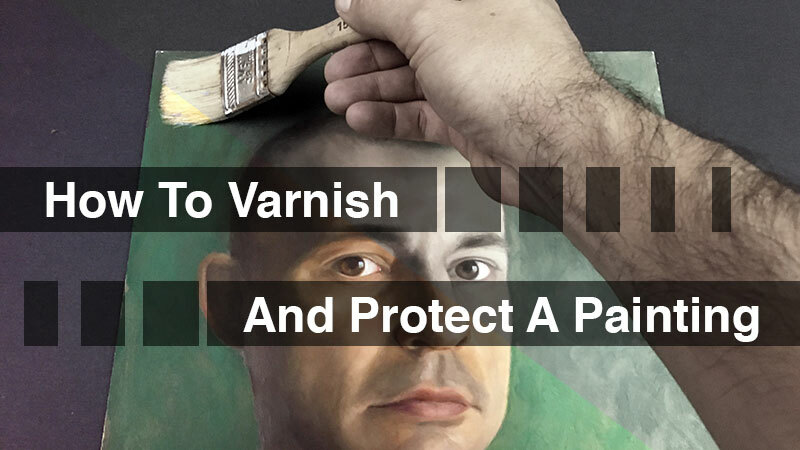 Don’t worry about visible brush strokes – the varnish will self-level. 4. Do not apply heavily. Do not brush over areas repeatedly. If, after one coat, the painting’s surface is still uneven in terms of sheen, apply a second or third coat. 5. Protect your painting from dust while it dries. 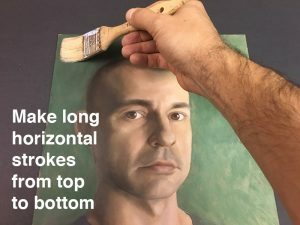 Use a plastic cover called a “tent” or wait about ten minutes for initial drying, then lean your painting so that the surface tilts slightly downward. This will prevent dust in the air from settling on the surface while it finishes drying. The varnish will dry to the touch in about 30 minutes. If a second coat of varnish is needed, wait at least twenty-four hours and apply in strokes that are perpendicular to the previous coat. NOTE: Wait six to twelve months before varnishing an oil painting. Though oil paint dries to the touch in just a few days, it retains some level of moisture for months. If you use Impasto brush strokes you will need to wait the full year. Patience is definitely a virtue here. Varnishing a painting too soon causes cloudiness to develop in a painting. That cloudiness is called blooming. It is actually moisture trapped under the varnish. Picture frames enhance a paintings presentation but serve another purpose as well – protection. A frame protects the edges of an artwork and provides a means of carrying and transporting an artwork without having to touch it. If you are framing an oil or acrylic painting, be sure to use proper hardware. Avoid using staples or nails to secure a painting into it’s frame. The likelihood of damaging a painting while removing the nails is far greater than if proper fasteners were used. 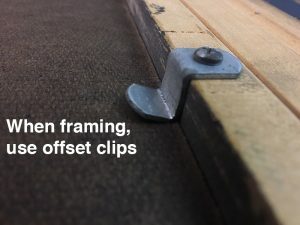 Both hardware and art supply stores carry the offset clips seen in the photograph below. What About Watercolors or Gouache? Works on paper (like watercolors) need protection too. Liquid varnish is not a good choice for protecting watercolor paintings. Liquid varnish will penetrate the watercolor paper and become a permanent part of the artwork, even altering the color. 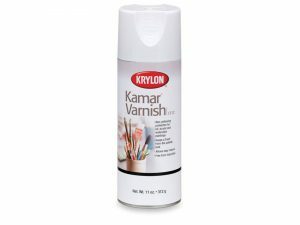 Although it is not recommended to varnish watercolor paintings, Krylon makes a synthetic spray varnish called Kamar Varnish. It is suitable for oil as well as water-based paints including watercolors. Kamar varnish provides some UV protection as well. For protection, watercolor paintings should be framed behind glass. Unfortunately, viewing artwork through reflective glass can be distracting. “Museum” glass (such as Tru Vue) eliminates the glare. It’s more expensive than regular glass but worth the extra cost. Be sure to use either a mat or spacers between a frame and the watercolor painting so that it doesn’t make contact with the glass. Acrylic paint is a new medium relative to the history of painting. It is quite literally plastic. How acrylic paintings will stand the test of time remains to be seen but the nonporous characteristic of plastics bode well for the medium. Perhaps acrylic paintings will endure millennia. Even still, an acrylic painting should receive varnish as further protection. Beyond the choices above, a popular choice is a wax-based varnish. Apply with a cloth and buff the surface to desired sheen. Whether you are a collector or a painter, buying and making paintings are major investments in money or time. So take the extra time to properly varnish your paintings and protect your investment for years to come.